As part of North Korea's propaganda machine, Jang Jin-sung spent his career writing eulogies of Kim Jong-il, before growing disillusioned and fleeing to South Korea in 2004. Here he describes life as a member of the North Korean elite. I wrote poems for the regime under a pen name, pretending I was a grass-roots poet from the South. 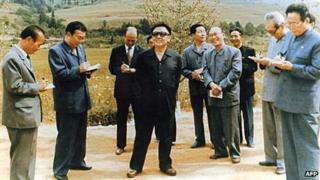 I wrote epic poems glorifying Kim Jong-il, which were published in the main newspaper in the North. I met Kim Jong-il twice. The first time, in 1999, I was overwhelmed and full of emotion. But at the same time I thought the image I had received of him - through brainwashing - was very different to how he appeared in person. Kim Jong-il's words are used as guidelines for running the country. He is a god-like figure. But when I met him I felt he was much more individualistic, even a bit selfish - and I was disappointed. I was given a Rolex watch as a gift when I met him and when I came to the south I saw the same watch at a department store for sale for about $11,000 (£7,000). The woman was emaciated / The sign hung from her neck / "Selling my daughter for 100 won" / With the little girl standing next to her / The woman stood in the market place. The woman was a mute / She gazes at her daughter / Her maternal feelings are being sold / Cursed at by passers-by / The woman stares only at the ground / The woman has no more tears. Clutching her mother's skirt / "My mother's dying," cries the daughter / The woman's lips tremble / The woman knows no gratitude / The soldier gave her 100 won, saying / "I'm not buying your daughter, I'm buying your motherly love" / The woman grabs the money and runs off. The woman is a mother / With the 100 won she received for the sale of her daughter / She hurries back, carrying bread / She shoves the bread into her daughters mouth / "Forgive me," wails the woman. Though the population was going hungry, he was using gifts as a way of buying loyalty and bringing those in his inner circle closer to him. After we met, Kim Jong-il asked his aides to take care of me and afterwards I received special treatment - the kind of benefits unavailable to normal citizens. Once you have met him in person, you can't even be prosecuted in court without a special signing off. For privileged, higher class, citizens there are three types of rations - a daily ration, a three day ration and a weekly ration. The state calculates everything a person needs in daily life, the amount of vitamins, calories, the kind of food you need to eat and so on. The daily ration is the highest, I received a weekly ration which was still very lavish. Most ordinary people were living from what they could buy in the markets, so I was lucky to get rations. Between 1994 and 1999 I believe over three million people died of hunger. I witnessed this. I saw that most people were living an entirely different life from the elite class. I realised North Korea was the poorest country in the world, presided over by the richest king - and that's why I wrote poems that were critical of the regime while I was still there. While the population of North Korea was starving in the 1990s, Kim Jong-il spent millions of dollars constructing the state mausoleum, which shows how wrong his priorities were. When I met him the second time it was quite shocking. We sat at a performance together, and he kept on crying while he watched it. I felt his tears represented his yearning to become a human being, to become an ordinary person. In our office we had free access to South Korean books, and I began to compare the two systems in north and south and to see the shortcomings of the regime in the north. I began circulating these books among friends who didn't work at the office and the spy agency discovered what I was doing. Things got a bit more complicated and I decided I had to leave. I had a special pass that was issued by my work - and that was good enough to travel to the border area with China and other special privileges that made travelling within North Korea possible. I wasn't able to tell my family I was going because I didn't want them to get upset. That separation was a sin that I had to commit. At the the Tumen River, I crossed the border into China with a friend. I spent a month in China, and then I stumbled across some people who helped me get into South Korea and finally to Seoul. One of the first things I noticed was how many trees there were in the mountains. I was also surprised by how many protests there were on the streets, I realised South Korea is a country ruled by the masses rather than a dictator. I was also surprised there were so many facilities for disabled people. In North Korea anyone who is disabled is banished outside Pyongyang. Jang Jin-sung spoke to Outlook on the BBC World Service, the interview was translated by Kevin Kim. Listen to the programme here.